Oxford University Press, 9780198614173, 580pp. Based on the highly acclaimed sixth edition of the Oxford Dictionary of Quotations, this new edition maintains its extensive coverage of literary and historical quotations, and contains completely up-to-date material from today's influential literary and cultural figures. Over 1900 new quotes have been added for this edition, as well as author descriptions, placing the quotes firmly in context. The dictionary has been complied using the unique process of quote identification by the largest ongoing language research program in the world, the Oxford English Corpus. An easy-to-use keyword index traces quotations and their authors, while the appendix material, including Catchphrases, Film Lines, Official Advice, and Political Slogans, offers further topics of interest. Complete with vivid illustrations, the Concise Oxford Dictionary of Quotations is an essential addition to every designer's and artist's studio shelf. 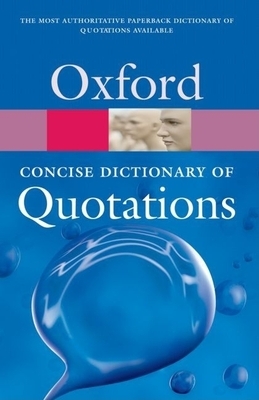 Susan Ratcliffe is an Associate Editor for Oxford Quotations Dictionaries, and has previously edited the Oxford Dictionary of Phrase, Saying, and Quotation, the Little Oxford Dictionary of Quotations, and Oxford Quotations by Subject.